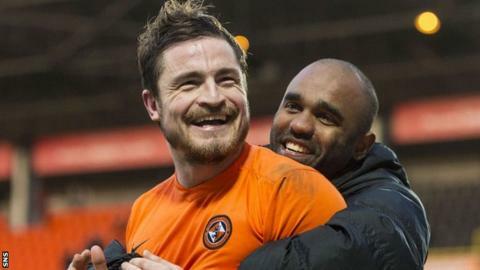 Paul Paton has been named Scottish Premiership player of the month but insists that Dundee United's upturn in results is more important. United's good form has coincided with Paton's return from long-term injury. "It's always nice," the midfielder said of his February award. "But obviously the most important thing is that it was a good month for the club. "We've got a lot of big games coming up, we're still positive and confident and we'll take that into those games." United remain eight points behind Kilmarnock at the bottom of the Scottish Premiership despite five wins in their last eight matches. But they bounced back from a midweek league defeat by second-top Aberdeen with a stirring 3-2 Scottish Cup quarter-final victory away to Ross County on Saturday. "We feel as if we're in good form, Wednesday night aside," said the 28-year-old Paton, who has recently deputised as captain. "We were playing a top side, so we won't get too down about that." Paton scored against Hearts and in their league win over County and has been described by manager Mixu Paatelainen as "an absolute man mountain". Meanwhile, team-mate Billy Mckay has singled out Paton as the reason for their changing fortunes. However, the midfielder who joined United from Partick Thistle in 2013 remained modest about his award after a month during which his side won three times and drew once in their five outings. "I won one last year, but I didn't expect it then and I certainly didn't expect it now," he added.